I am indeed happy to be here this afternoon to attend the First Convocation of the Indira Gandhi National Tribal University. This is a long awaited and proud moment for all the distinguished students who have received degrees. I offer my felicitations and congratulations to the graduates and those who have received awards for meritorious work and the faculty who have nurtured them. The tribal population in India is 104 million as per 2011 Census and accounts for 8.6 per cent of the total population of India. They suffer from geographical and cultural seclusion, and inadequate physical infrastructure. This results in the low capacity of the tribal economy to meaningfully absorb funds, including institutional finance. Tribal communities have also been found to lag behind the general population in maternal and child mortality, size of agricultural holdings, and access to education. The dilemma in preparing any policy for the Scheduled Tribes in India is how to strike the right balance between preservation of tribal identity, the very distinct and reach culture and values, while ensuring their access to mainstream education, health care and income generation so that the quality of their life is improved. The Indira Gandhi National Tribal University is an important instrument to fulfill the unmet need for greater access to education for the tribal communities. I am happy to know that right from the beginning, the strength of the students belonging to the Scheduled Tribes category in this University has been nearly 46 per cent. I also further happy that almost 40 per cent of the student community comprises girls. 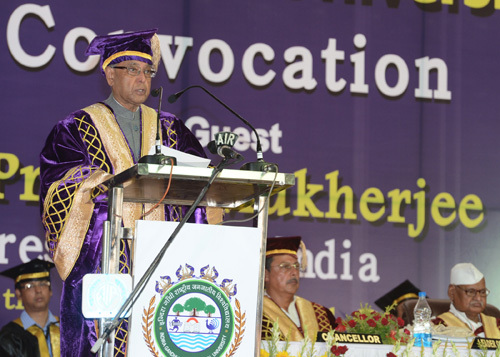 I am pleased to know that the University has opened its Regional Campus at Manipur, which is home to substantial tribal population. I am told that graduates from the Regional Centre are also receiving their degrees today. That the teachers of this University come from 18 states of India, reflects its National character. Educating a girl is the best antidote to many problems plaguing our society, like infant mortality, maternal mortality, health of the family, etc. Educated women will impart not only good moral values to her children but will also strengthen the moral fabric of society at large. If the right education and correct moral values can be imparted from a very impressionable age, we will surely be able to develop an individual with a balanced frame of mind who contributes to the society in a constructive manner. Education is a potent tool to effect socio-economic transformation. The rising incidents of crime against women and children call for effective measures to ensure their safety, security and dignity. It also underlines an immediate need to arrest the moral decline in our society. Our universities must take the lead in meeting the contemporary moral challenges and ensuring that our civilizational values of love for motherland; performance of duty; compassion for all; tolerance for pluralism; respect for women and elderly; truth and honesty in life; discipline and self-restraint in conduct, and responsibility in action are fully entrenched in the young minds. The entire way of life of tribal communities is interwoven around harmony with and preservation of nature. Tribals have been at the forefront of conservation of nature and there is a strong mutually beneficial relationship between tribals and forests. However, the rights of tribals over traditional land holdings in the forests have often come under dispute. Poor land record systems coupled with illiteracy, poverty and ignorance have led to transfer of resources from tribals to non-tribals in many parts of the country. Diminishing access to natural resources has led to impoverishment of tribals often reducing them to the status of migrant labour. In many instances, inadequate rehabilitation of displaced tribals compounds their woes making them asset-less and unemployed. The non-empowerment of tribal communities remains one of the critical factors responsible for the less than desired outcomes in all interventions, monetary or otherwise, meant for their development. There is urgent need for sustained and focused attention by state and central Governments on the protection of rights and enhancement of welfare of the tribals. The fruits of development must reach the most under privileged communities of India. To my mind, to debate whether development should come first or security, is a futile exercise. The two must go hand in hand. The safety and security of our citizens in tribal areas must be ensured. They must be enabled to become equal participants in the nation building process. At the same time, the nation as a whole must make clear that incidents such as the recent attack by Maoists in Chhattisgarh on a convoy of vehicles leading to heavy loss of life is not at all acceptable. Violence has no place whatsoever in our democratic polity. Our nation will neither be overawed nor intimidated by such efforts to terrorize the public. Permit me to use this occasion to express my deepest condolences to the families of those killed in the incident once again and offer my prayers for the speedy recovery of those injured in the incident. At this point of time, when the country is marching forward in unity, it is absolutely essential that we ensure that all segments of society participate in and benefit from inclusive and equitable growth. The Government of India has adopted several measures for the development of the tribal population. It has emphasized rapid educational development to bring tribals into the mainstream of the population. The Government has allocated considerable amounts in the successive Five Year Plans to provide infrastructure and other incentives, for example, scholarships, free boarding and lodging, free distribution of clothes, books, stationery, etc. for better educational attainment by the tribals. But, desired change in the social and economic conditions of tribals is still slow. Education is perhaps the most important means for human empowerment and national progress. A nation’s development is dependent in large measure on its educational status. Our strategy of high economic growth aims at overcoming poverty and ensuring development for all. We have to make economic growth relevant for our people, especially those at the bottom of the socio-economic pyramid. Distributive justice, as a higher goal of democratic polity, can be achieved only through a sound education system. India’s demographic structure is changing, and by 2025, over two-third Indians are expected to be in the working age bracket. We must take advantage of this demographic dividend, but for that, our youth must be qualified and trained to participate in national progress. They must be prepared through quality higher education and vocational training. Our higher education sector needs improvement both in terms of quantity and quality. We have to effect innovative changes in the way education is imparted in our institutes of higher learning. A culture of excellence must be inculcated in them. There must be greater use of technology models like e-classrooms that can enable information and knowledge sharing by wider dispersal of lectures overcoming distance. It can address the challenges of quantity, quality, accessibility and faculty shortage. Many places in our country do not have a higher educational institution in their vicinity. This, along with economic difficulty, effectively denies many bright students from pursuing higher studies. Its consequences are disturbing. Enrolment rate in India for the 18-24 years age group is only 7 per cent. Compared to this, it is 21 per cent in Germany and 34 per cent in the US. Greater access to higher education, especially in remote areas, is the need of the hour. It will entail not only setting up institutions and gearing up the capacity of existing ones, but also making increased use of technology solutions and student aid programmes to make it affordable for meritorious students belonging to economically difficult background. Late Shrimati Indira Gandhi, our former Prime Minister, in whose memory this University has been named, had in her first Independence Day Address stressed the need to focus attention on the weaker sections of society particularly tribals. I am confident of this University taking every possible step to realize her vision and providing a strong impetus for quality higher education and research for the tribal population and giving a new direction to our tribal youth. The strength of this University lies in its students. It must invest adequately in their academic, moral and personal development. I draw your attention to the advice of Mahatma Gandhi who said and I quote: "Literary education is of no value, if it is not able to build up a sound character” (unquote). As you grow in life, remember that there is no end to education and learning. Always move ahead with an open mind to widen your horizons and reach new heights. All challenges can be overcome if you work with sincerity and dedication, and maintain an inner poise. I wish you all the best in life and career. I take this opportunity of congratulating the management and all the stakeholders who have nurtured this university.